Are These 27 Difficult Job Interview Questions the Toughest Ever? Job interviews make me all sweaty. I still vividly remember my interview with The Penny Hoarder. Clad in a dress that somehow hadn’t wrinkled in the back of my car (I was in the middle of moving), I walked up to the front door and rang the doorbell. “Was I supposed to do that?” I asked myself, suddenly questioning the very routine task. The hiring manager showed me around the office. She offered me water. I accepted. “Was I supposed to accept that?” I asked myself, suddenly questioning the kind gesture. And, although I tried to act cool, I did sweat. (Thank goodness I accepted that cold water.) But luckily, the questions were straightforward and conversational — from what I remember, because I sort of blacked that part out. But others don’t get so lucky. 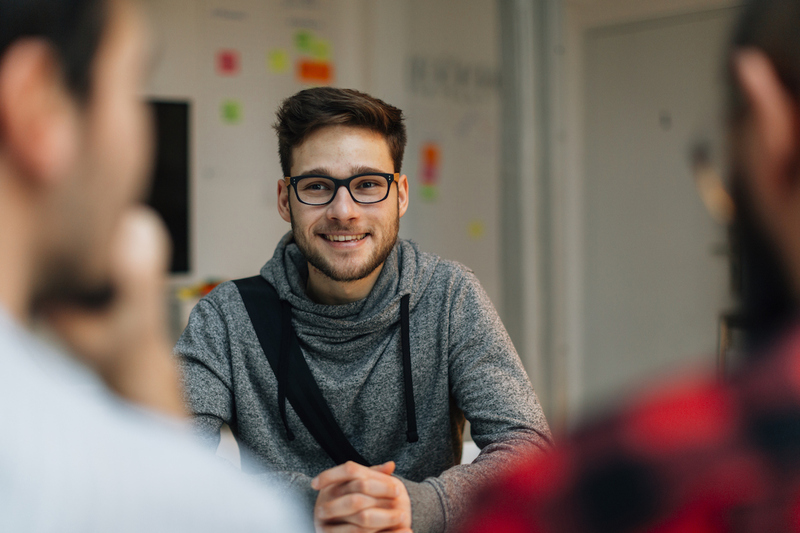 Glassdoor compiled a list of 27 jobs with tough interview questions, and almost all of them make me wince — and sweat, just a little. Glassdoor, a large job-hunting and recruiting platform, has a number of interesting features, including its interview section. Former interviewees can submit questions hiring managers asked them. These are then sorted by job title and company. It’s kind of like cheating on a test, but I think it’s more ethical… right? Anyways, Glassdoor combed through its database and examined a year’s worth of questions. It compiled 27 zingers. Use this list as you wish: to have a good laugh, to prepare for your own upcoming job interview or to detox via nervous sweats. Plus, I’m really curious… How would you answer these? “How do you explain a vending machine to someone who hasn’t seen or used one before?” — Bloomberg LP, global data analyst. “If your current employer had an anniversary party for you, what five words would be written on the cake to describe you?” — Express, district manager. “Who in history would you want to go to dinner with and why?” — PSA Airlines, flight attendant. “Prove that hoop stress is twice the longitudinal stress in a cylindrical pressure vessel.” — SpaceX, operations engineer. “Name a brand that represents you as a person.” — Twitter, brand strategist. “Estimate how many employees in the next building.” — Risk Management Solutions, data scientist. “How many happy birthday posts do you think Facebook gets in one day?” — Facebook, sales operations. “If you had to take only one item to a deserted island, what would that be?” — Squarespace, customer service representative. “Please describe an instance where you had to make a decision without all of the necessary information.” — Athenahealth, analytics. “How do you reverse a text string on the Unix command line?” — Capital One, developer. “If you are in a boat with a boulder and you drop that boulder into the lake, how does the water level before and after you drop the boulder in the lake compare?” — Apple, mechanical design engineer. “You have been asked to lead a multi-million dollar, multi-year grant that will be supported across several companies and universities. How do you start?” — Ford Motor Co., research scientist. “Sell me on one idea, and then sell me on the opposite of that idea.” — Blizzard Entertainment, solarwinds administrator. “How would you go about to find the top five Java Developers in a certain area?” — Google, technical recruiter. “If you were a Muppet, which character would you be?” — LifeNet Health, donor family advocate. “Write an equation to optimize the marketing spend between Facebook and Twitter campaigns.” — Uber, analyst (data science). “What part of the newspaper do you read first? What does this say about you?” — BDO USA, audit. “If a coworker had an annoying habit, and it hindered your quality of work, how would you resolve it?” — Procter & Gamble, production technician. “Throw your resume aside and tell me what makes you you.” — Zillow, sales executive. “How would you find the square root of 1.2?” — Jump Trading, hardware engineer. First, keep in mind that Glassdoor intentionally put together the toughest questions it could find. Second, there really aren’t any right answers to most of these questions (though there’s only one capital of Canada). Rather, the goal of the employers is to see how you think and solve problems. Third, just be sure to prepare for your dream job interview. You’ll want to research the company. Get to know it, as well as the role you might take on. To be honest, you can never research too much. Also, practice, practice, practice! Here are 20 common interview questions. Have your friend, spouse or mom play hiring manager. While you answer the questions, take notes of the ones that stump you. And be sure to be aware of your body language. Oh, and if you need a good belly laugh thrown into the mix, read these horror stories. Your Turn: What’s the toughest question you were ever asked in a job interview? Carson Kohler (@CarsonKohler) is a junior writer at The Penny Hoarder. To be honest, she remembers walking into her job interview but kind of blacked out the questions she was asked. Oops.